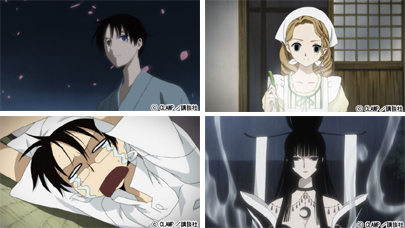 Presepe, Famitsu, MyCom and GA Graphic have reports from the finished after-recording sessions of XXXHOLiC Shunmuki. There’s no new information about the OADs in the articles (that have basically the same contents for all four), but they do have the first screencaps of it, so make sure to check them out! It’s looking good! And Watanuki’s eyes have different colors, for once! I’m trying to sneak a friend of mine in the early screening event, I’ll let you know if everything goes right! Thank you so much for the info! You know how many minutes the OVAs will have? >You know how many minutes the OVAs will have? Thanks for the in info~~. Sorry XD. I made a mistake in the explanation ^ ^ U. > It’s looking good! And Watanuki’s eyes have different colors, for once! Oh yeah, I remember that, it was right after he got Doumeki’s eye. oh! watanuki looks sooo GOOD! *-*^thanks for the info! different colored eyes, YAAAAY!!! funny how we’re so excited over this XD i don’t understand why it was never included in the TV anime..
First thought: nani? an extra episode for the xxxholic kei?